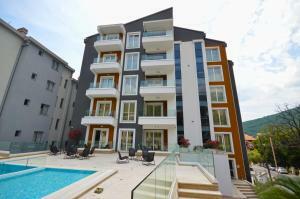 Apartment Miran San in Budva features accommodation with free WiFi, 1 km from Slovenska Beach. The property is 300 metres from Budva Old Town. With direct access to a balcony, this air-conditioned apartment comes with 1 separate bedroom. A TV with cable channels is available. Richardova Glava Beach is 350 metres away, while Jaz Beach is 3.4 km from the apartment. Tivat Airport is 16 km away. When would you like to stay at Apartment Miran San ? This apartment has a seating area, washing machine and oven. Each day we'll check prices and send you an email for your selected dates at Apartment Miran San. If you don't have specific dates but would like to check prices for say next weekend or say next month we can check the price too. Click to write a review and share your experience of Apartment Miran San with other travellers.